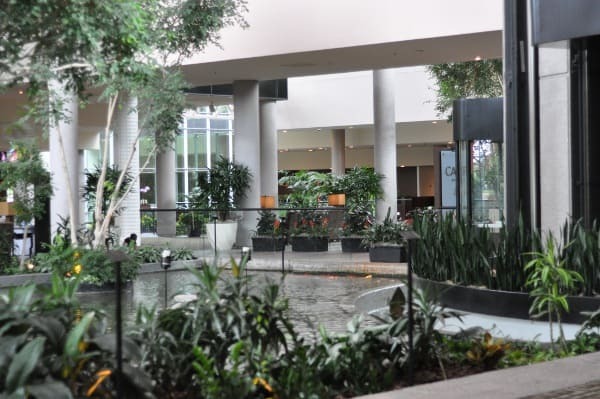 Home»All»Where to Stay in West Houston… Tips for Visiting the Omni Houston Hotel at Westside! 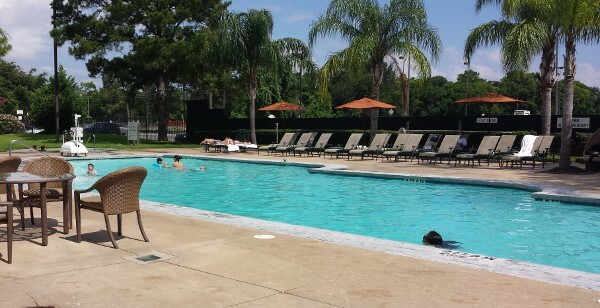 Where to Stay in West Houston… Tips for Visiting the Omni Houston Hotel at Westside! This Houston hotel surprised us. When we drove up and saw the shiny black Omni Hotel and the neighborhood full of corporate offices, we really wondered how fun our evening in west Houston was going to be. 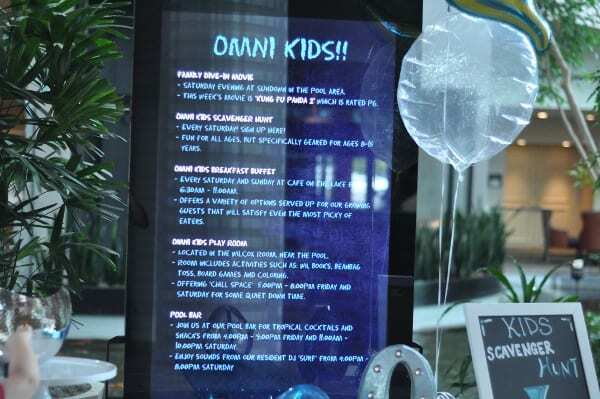 But, as soon as we walked into the lobby, fed a hundred giant goldfish, grabbed a scavenger hunt and saw the itinerary for Omni Kids, we knew we were in for a pretty good night. 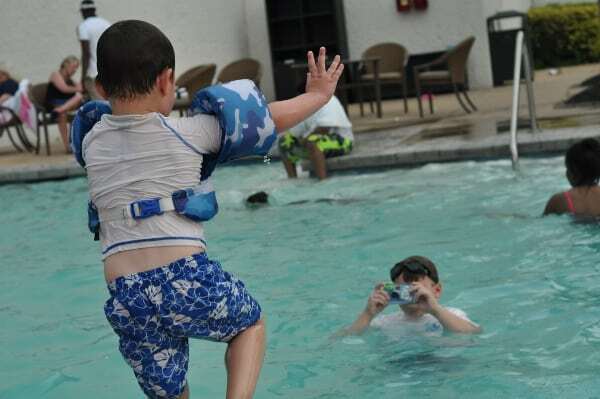 The Omni Houston Hotel at Westside invited us out to try the Summer of Fun and Sun Package… which includes a discounted PoolSide menu, Pool Bag (with underwater camera for the kids! 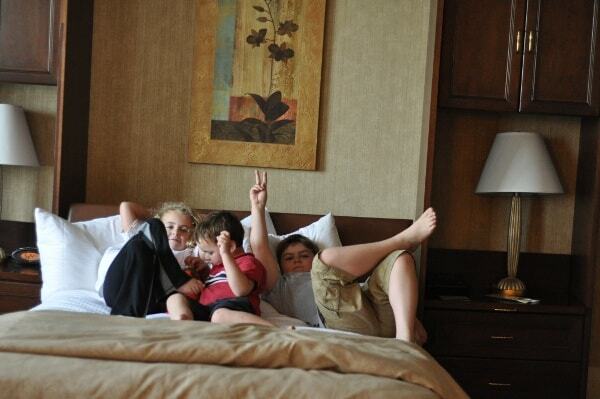 ), Kids Activity Backpack, Poolside Family Movie, Milk and Cookies Turndown Service and breakfast. So we went. 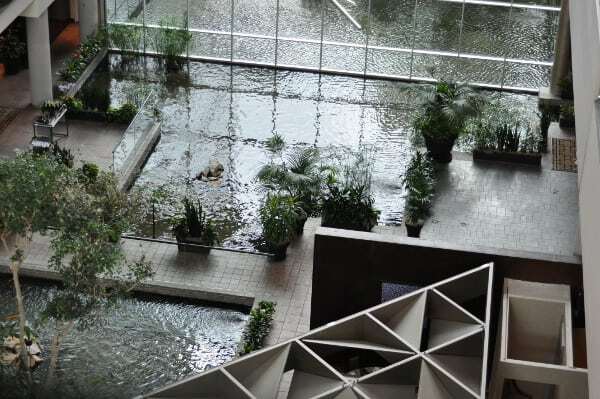 And when we arrived, we saw an lobby that was open up to a ceiling 5 stories up, a lake that seemed to run from outside to inside, ducks, giant goldfish and turtles. 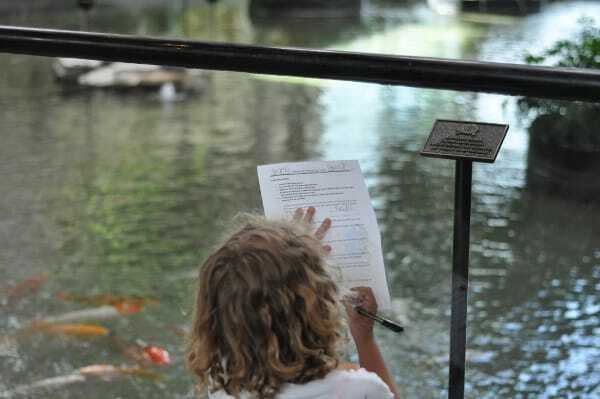 And when we walked in a few more steps, we found a table with scavenger hunt sheets and food to feed the fish! 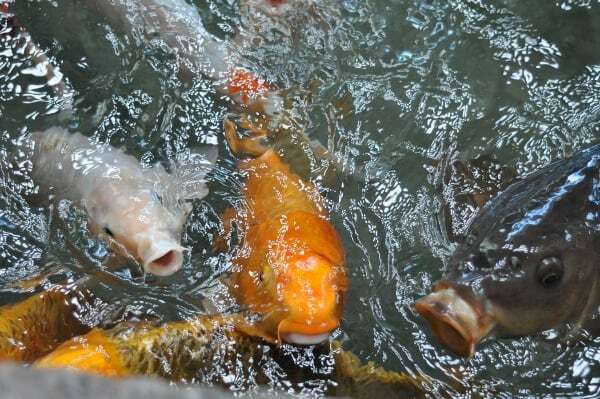 Of all the things to do, feeding the fish was the coolest. 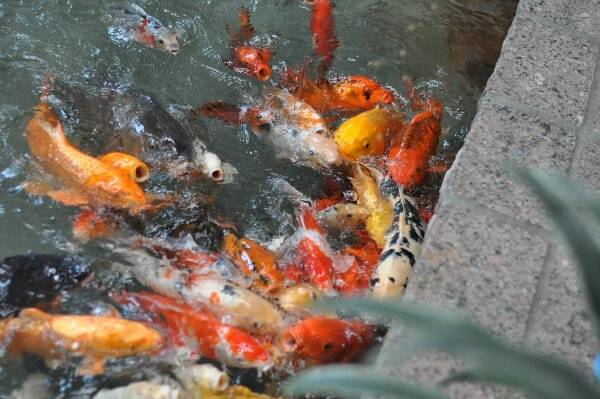 Dozens of giant goldfish come right up to the edge and ask for your food. We fed the fish, opened up the activities in our Kids Backpacks, explored the hotel with our scavenger hunts and enjoyed the milk and cookies in our rooms. Before dark, we grabbed our underwater camera and headed to the pool. 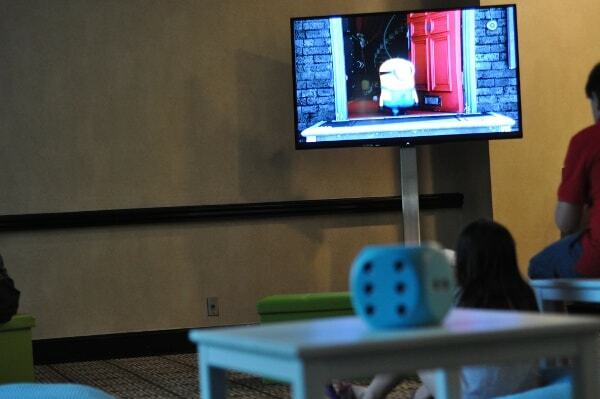 At dark, the movie was moved indoors because of rain… but we did not mind watching Kung Fu Panda in the ballroom. Room rates seem to be pretty reasonable. I’ll let you decide, but they are less expensive than I expected for an Omni Hotel. 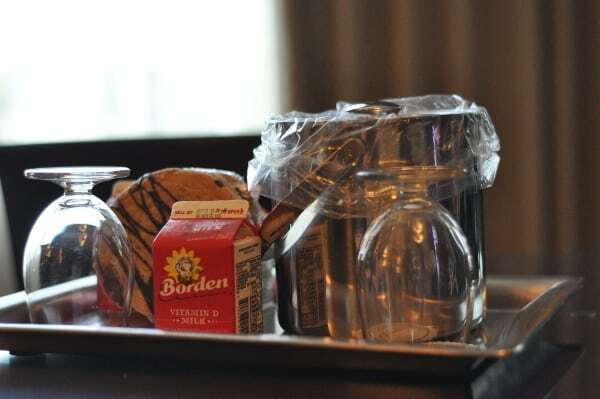 The Summer of Fun and Sun Package includes the summer bag, kids backpack, milk and cookies and breakfast buffet for each guest. The big buffet is $20 on it’s own. On Saturday afternoon, the kids room was open. It was pretty basic, with a movie, video game system and bean bag toss. My kids assured me that it was great (probably because we do not have video games at home) and urged me to leave them. For the kids room, there is no formal sign in process, so I stayed close and let the kids think they were on their own. If you have a wanderer, they really could wander out. The pool looked small from the driveway, but was bigger than expected when we went outside. On Saturday evening they have music and a grill… and a ton of people were in it. There were a couple of cool lounge “pods” and a lot of regular seating. Shade is pretty limited, but we had sun screen in our Summer of Fun and Sun Bag. The pool is not a water slide/resort kind of pool, but it is wet and fun for the kids…. and it was more empty (and more enjoyable) in the morning. We brought our own (affiliate) Puddle Jumper/Life Vest. Towels are available poolside… but no vests. No lifeguards are on duty, so you need to watch the kids. The underwater camera, in our Summer of Fun and Sun Bag, was the highlight of pool time. It’s an old fashioned disposable camera… and the kids were confused about why the pictures did not show up on a LCD screen… so I told them about the old days. It will be interesting to get the film developed (onto a disk) and see what my photographers captured. Snacks. 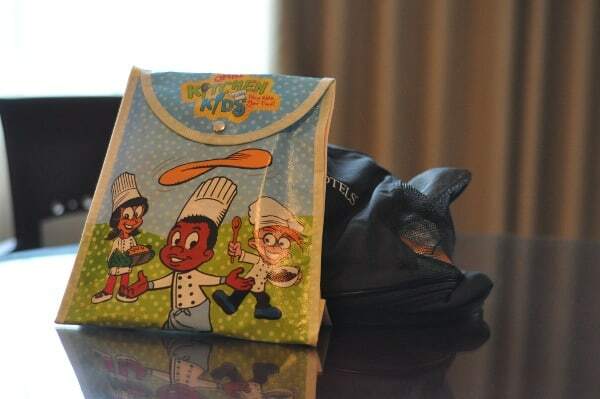 We always bring snacks with us to hotels… because my kids would eat and eat and eat from the restaurants. The Breakfast Buffet is big. Like, eat on Sunday morning and eat a salad on Sunday night. It has omelet stations, hot food, cereal, oatmeal, lots of fruit, smoked salmon and plenty of coffee, tea and juice. The lobby, lakes and fish are the nicest parts of the hotel. I really liked how they looked in the evening with the light reflecting off the indoor and outdoor water. Wifi is free for rewards members (and being a rewards member is free). A hotel bus will take your to CityCentre, Memorial City Mall or within 3 miles of the hotel, for free. Valet and (free) self parking are available. 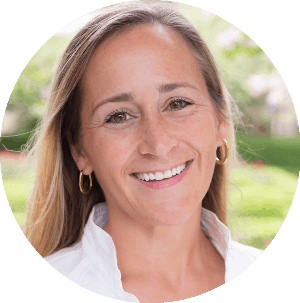 Beginning June 21, 2016, for every stay booked directly on OmniHotels.com, Omni will make a donation to Feeding America that will provide a family of four dinner for an entire week! Donations will benefit Feeding America, and the Houston Food Bank. 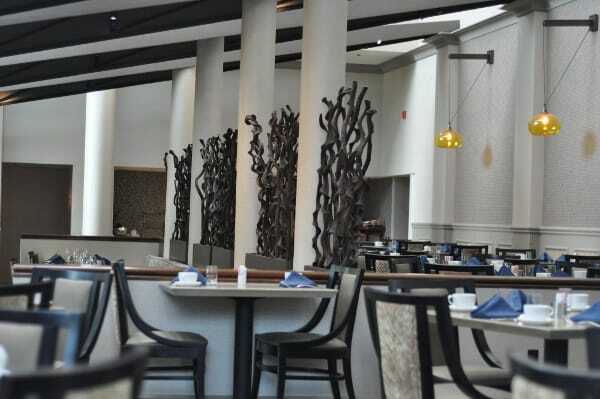 Take a look at more pictures below and consider Omni Houston Hotel at Westside, not far from CityCentre!